We live in a modern world with all kinds of threats such as cyber threats, nuclear weapon threats, and etc. But, I believe the biggest threat to western civilization has been and remains today are the socialist minimum wage law, period. My reason for having this belief is because of the socialist minimum wage law’s effect on societal discipline. As a rule it is not possible to keep a free market place economy pass 5 generations without strong societal discipline protecting the nations culture and morals values. 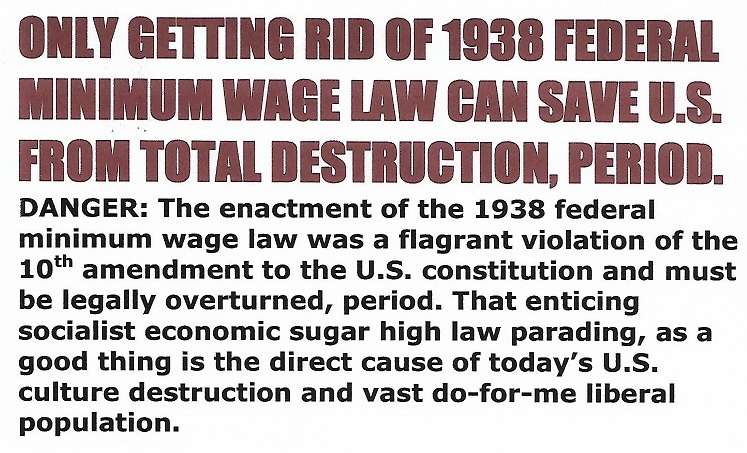 The socialist minimum wage law blocks and eliminates societal discipline in a free market place economy by taking away its purging power. The criminal laws in a nation can become political, like what is taking place in the USA today on a grand scale. So, without societal discipline there is no dependable means of preventing run away extreme liberalism insanity from over powering common sense and sound judgment, which is now taking place on a grand scale in my beloved USA. FREDDIE LEE SIRMANS LOG: 21 MARCH 2018, 1226 HOURS.